Story or Artwork…Which is More Important?‏ | Portraits of M.E. This past weekend I went to Barnes & Noble to purchase a few books for my husband’s upcoming birthday. I knew exactly what section of the bookstore to visit because every time we stop at Barnes & Noble, we head up to the Children’s book area on the second floor. As I walked over to the children’s clearance area, my husband made a beeline to the same spot he always does when we’re in the Children’s section. 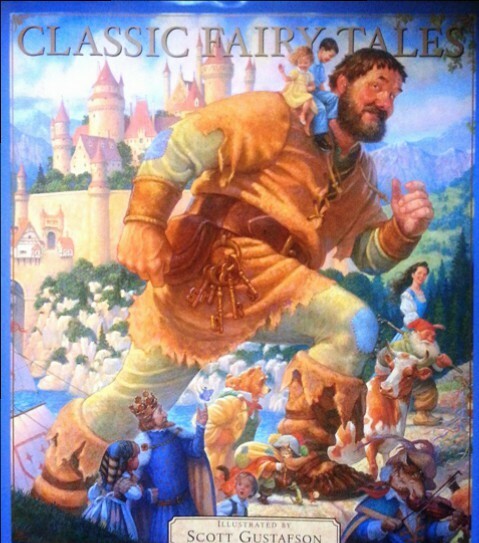 The three illustrated books by Scott Gustafson were still on the same shelf and my husband picked up one of the books. He loved to flip through the pages and admire the drawings within. As he looked at the paintings inside, he would sometimes call me over to look at a certain picture he thought was exceptionally well thought out. When this happened he would make a comment like, “this book would make a nice Christmas gift”, or “my birthday is coming up” and from these hints, I knew he really liked these books. So when the time came for me to buy a birthday gift for him, I knew exactly where to go! I was in luck too. The books were still there sitting on the shelf. There were three books total, but at $40 a book I knew I couldn’t afford them all, so how was I to select which books to purchase? Since I’m not an artist, I decided to choose by the quantity available and not by the artwork inside. I decided to get the titles that had the fewest quantities available since we could always come back for the third book at a later date (which might even make a great Christmas present). The two books I chose were Favorite Nursery Rhymes from Mother Goose and Classic Fairy Tales. The next day as we celebrated his birthday, I couldn’t wait until he opened the gift I had purchased for him. I had no need to worry – my book selections were a hit! When he opened the gift and discovered the books, a broad smile formed across his face. I could tell he was surprised to receive two of the books he’d been coveting for quite a while. While flipping through the pages, he shared with me the pictures he liked the most and the reasons why they were such good illustrations. It was neat to see how much my husband loved the artwork inside these books. Since I’m a reader, I am normally drawn to the cover art and then from there to the story. I don’t care if a book has pictures in it or not, I am more intrigued by the words. So seeing how my husband responded to the books was a new experience for me. If I had seen a beautiful picture, but the story wasn’t well written, I would have passed on the book. My husband, on the other hand, would have probably bought the book for its artwork. This was a new concept for me. How about you? Is the artwork a main feature when purchasing a book? Or are you more like me and it’s the story that matters the most? 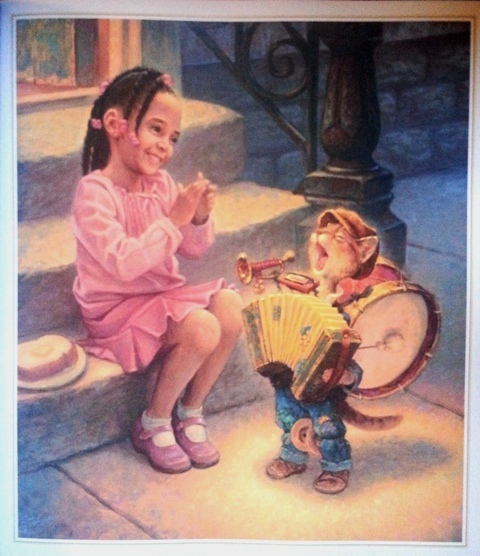 Luckily for us, the books I bought contain both fun, traditional stories, as well as, beautiful artwork. This makes them a welcomed addition to our library and I’m sure both of us will find pleasure in reading the stories while admiring the pictures. Now, let me share with you a few of those beautiful pictures my husband adores. Click each picture to enlarge…and enjoy the artwork created by Scott Gustafson. 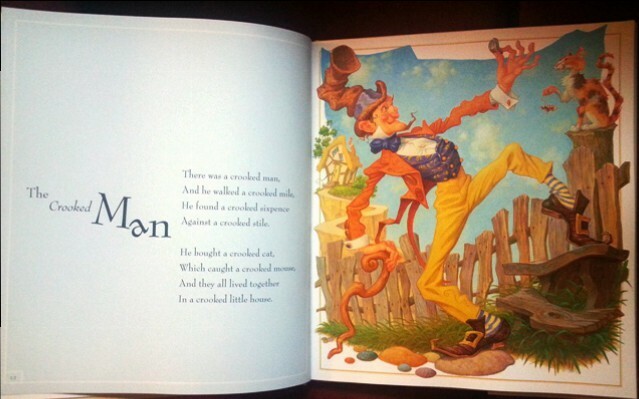 Mother Goose, “The Crooked Man”. 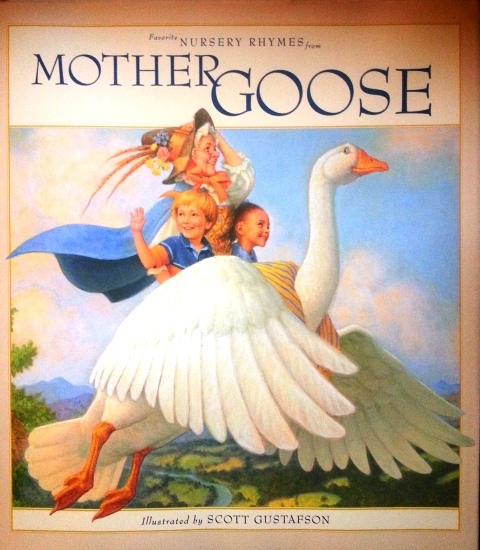 Mother Goose, “Little Tommy Tucker”. 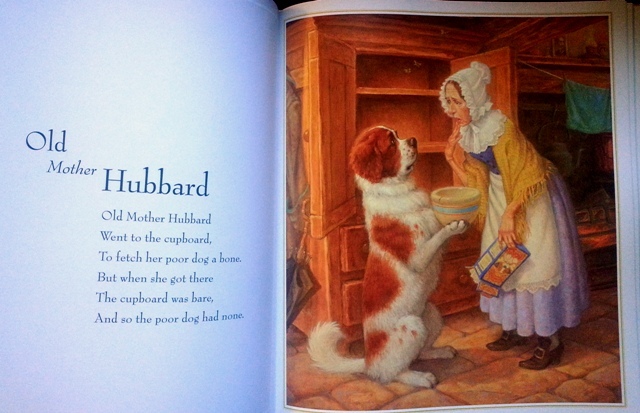 Mother Goose, “Old Mother Hubbard”. 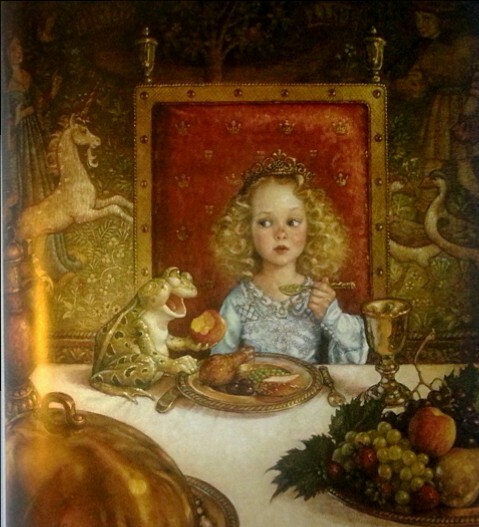 Classic Fairy Tales, “The Frog Prince”. 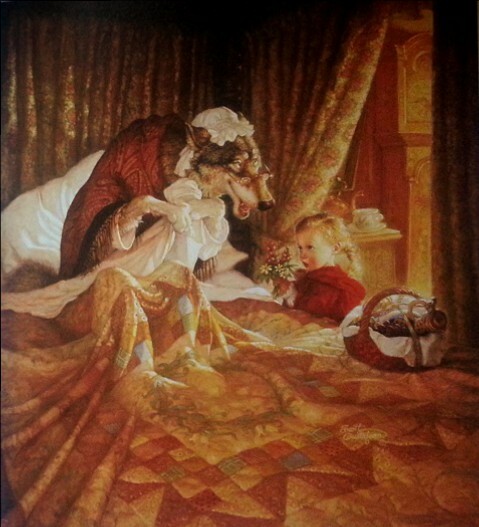 Classic Fairy Tales, “Little Red Riding Hood”. 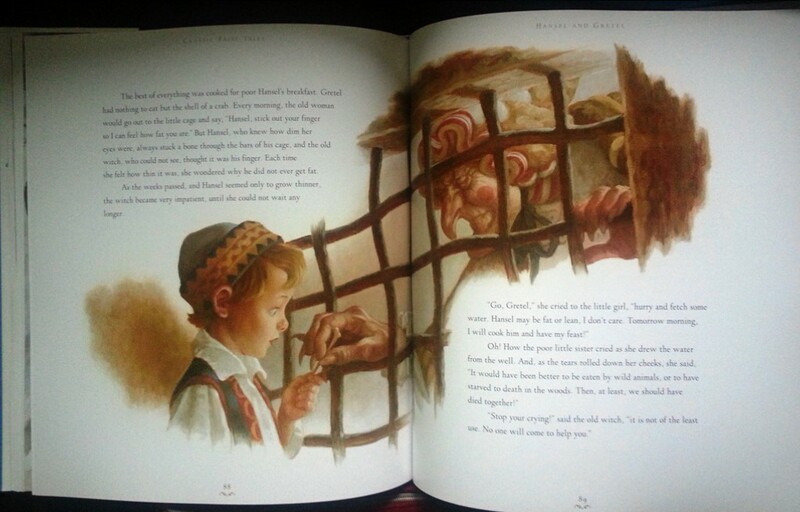 Classic Fairy Tales, “Hansel and Gretel”.